Every age has a corresponding token of status. We recognize wealth and privilege by the stuff that we crave and from cradle to grave, those symbols change. For the elderly, look for the high end Buick and jewellery. For people of status in middle age think Lexus or BMW, big house or boat. The young seek high end gaming consoles or the 65 inch flat panel screen. Teenagers show off the iPhone 6 with all its large screen glory. But for the very young, status comes with sugar. Each acquisition maintains the same basic principle of great financial planning and requires planning and saving. When I was a child, we had Halloween night planned, analysed and rehearsed to the last detail. Every aspect of the evening, from the route we took to the neighbourhoods we chose was planned. Pity the child who carried a plastic pumpkin to collect candy. We were armed with extra large pillow cases. Nothing compared with the joy of dumping the fourth and final load of candy onto the living room floor and scooping the heaping pile of treats into your arms...a confectionary treasure...all mine. Sugar has an amazing effect on a child’s brain. Left unchecked, some children will eat until they are sick. Others will escalate into a sugary high of hyperactivity, silliness, and even tantrums and tears. I remember my parents scolding us and forcing us to put some candy aside. I never regretted that. I was always a “saver” anyway. My parents did not usually buy us candy so having my own stash weeks and even months later brought me great satisfaction. Halloween has some life lessons of great value. Children who learn the art of “budgeting” their candy can learn the three secrets to effective wealth management. 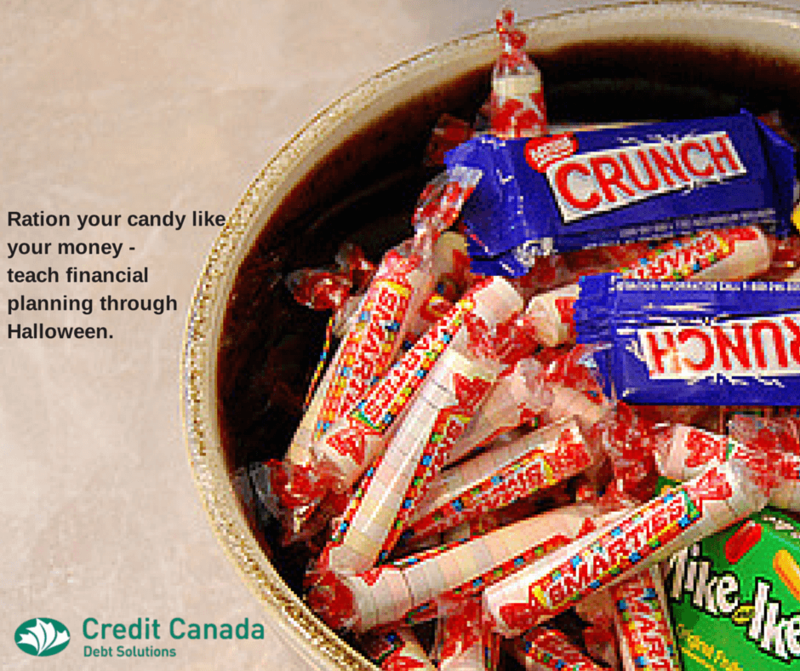 Secret #1: Budgeting your candy wealth keeps you out of trouble. My parents sometimes confiscated my brother’s Halloween candy when they found him sneaking handfuls of those chewy Halloween toffees in orange wax paper. People who restrain their impulses are more likely to have less debt, better credit scores and cash when they need it. They pay fewer service charges for overdrawn accounts and have ready access to credit when they need it. They plan financial decisions properly and stick to the plan. Secret #2: Budgeting your candy wealth allows you to get more enjoyment out of your wealth. Have you ever spent a full paycheque the same day you received it? I have. Like a child who munches mindlessly while watching tv, candy can disappear very quickly and you wonder, where did it go? Instead, budgeting your wealth allows you more time to enjoy it. Secret #3 Budgeting your candy wealth can bring you more status and power. I quickly learned that my brother and sister were willing to do me favours to get my candy long after theirs was gone. That is status in its purest form. In a world where most people consume their entire income and more, we have lost sight of the virtue of saving. Even a small amount of savings can help you gain the status and power of having control over your finances. Secrets I learned as a child, it turns out were later demonstrated in the famous Stanford Marshmallow Experiment. Controlling the impulse to consume, whether sugar or dollars, leads to success in many areas of life. Like any symbol of wealth, the greatest joy is not in the consuming, but in the budgeting once you have accumulated a pile of sweets.